Spring is here. And while for some that means long walks outside, more daylight, and the beginning of baseball, for many homeowners it means the onset of pests. And the most common pest that has to be dealt with in the spring and summer months is ants. They’re everywhere, they’re small, and they’re incredibly hard to get rid of. Ants are a nuisance, more than anything else. Though they can cause structural damage. They infest homes and can be rather unsightly to your guests. How do you get ants? How do you get rid of them? And what dangers to they pose to your home? We’ve outlined your go-to list of everything you need to know about ants this season in order to protect your home from invaders. How Do I Get Ants? It sounds like a cliché but having an overly accessible food source is the main way you get ants. They tend to nest outside of homes, but if they have a path to food, say to a pantry or to food sitting on your counter, they will take advantage of it. 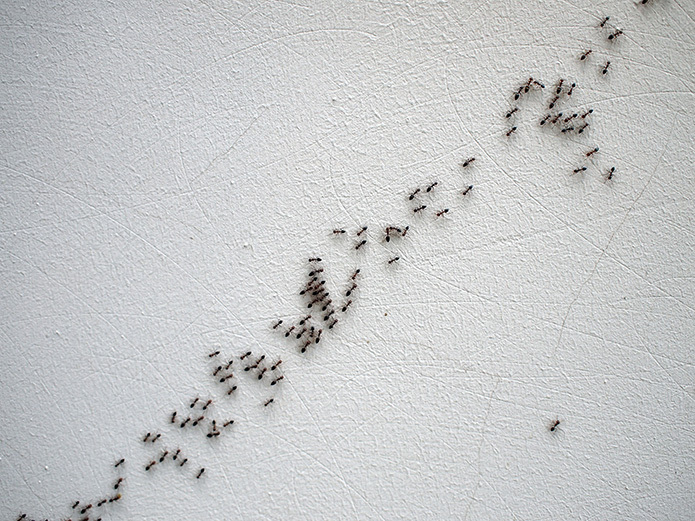 Not cleaning food spills and leaving crumbs is a quick way to attract a nearby colony of ants. Your typical black ant won’t be much of a problem structurally to your home. They find their paths into a place rather than chewing through structure to make one. But carpenter ants can be a real problem and fire ants can be dangerous to small pets and children. Be aware of the type of ants in your home. It would be almost impossible to seal of their entrance as ants can use virtually anything to get into a home. Cutting off the food supply and killing the colony is the best method. Ants hate vinegar, so that is a common ingredient in homemade, non-chemical pesticides. It’s also common to vacuum ants up as well. Calling a professional pest exterminator is, many times, the best option. Is It True Baking Soda Kills Ants? Yes. If you’d like to set a trap for your ant colony, a common way to do it is to use sugar and baking soda. The sugar will attract them and the baking soda, once ingested, reactions violently with their body acid and causes them to, quite plainly, explode. What Is the Best Way to Destroy a Colony? The small mound that ants come out of is, literally, only the surface of the colony. Tunnels in ant colonies have been found to go as far as 10 feet underground. So, it takes a lot to dissipate a colony of ants. One way to do it is to pour boiling water onto the colony but you need to use a lot of water to cover the depth the colony can go to. Again, the best option is to call a professional pest control service. Don’t let ants cause a problem in your home. Spring has sprung and the ants are starting to come out. Be prepared and know when it’s time to call in for help. An ant nest can be difficult to locate so it’s best that you let a professional pest control company handle this issue. Hi-Tech Pest Control can help! Hi-Tech Pest Control has been eradicating pests and bed bugs for over 30 years! Whether it crawls, flies, bites, or destroys — no matter how in-depth your pest problem is, Hi-Tech Pest Control can solve it. Request your free inspection and let us get rid of your ant, bedbug or pest problem!